The Ash-throated Crake (Porzana albicollis) is a small secretive crake found in South America, specifically Argentina, Bolivia, Brazil, Colombia, French Guiana, Guyana, Paraguay, Peru, Suriname, Trinidad and Tobago and Venezuela. Its natural habitats are subtropical or tropical seasonally wet or flooded lowland grassland and swamps. 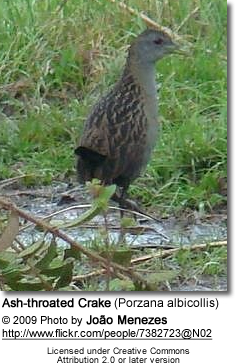 They have a brownish plumage with black and olive brown streaks on the back. They have short bill. The tail is black and the under parts are slate - except the throat, which is a pale grey. The lower flanks and under tail coverts are barred black and white. Their nest is a large open bowl made out of dry grass, situated on the ground or just above. It is usually well hidden between tree roots or grass. The average clutch consists of 2-5 eggs. They may also accept constructed nesting boxes. Their staple diet consists of insects and insect larvae and grass seeds.